Given the general difficulty of writing about music, it's pretty common to resort to metaphors; the first one that comes to mind regarding Ampledeed is "all over the map." I'm not sure if it would be wise (or even appropriate) to say Ampledeed doesn't recognize the validity of maps, so I'll just leave it at "all over" with regards to the geographical comparison. A Is for Ampledeed consists mostly of short tracks (ranging from three under a minute to a few over five minutes) in a wide range of styles. The opening track, "We Breath Time," exhibits the same diversity within its own confines. There is a quiet guitar intro with a vaguely latin feel, several different sections of keyboard-driven progressive rock, some freaky signal manipulation, and more — in a variety of tempos and time signatures. The vocal sections are nicely done, with good work both in the lead and backing parts; in the more laid-back parts, I'm reminded of Camel (like Breathless). When they prog it up, they remind me of the better American bands of the last 20 years, like Echolyn and Underground Railroad, but their restlessness, while not as jarring as Mr. Bungle, sets them apart from those predecessors. When keyboards are so prominent in the arrangements, bands run the risk of sounding like copycats of one of the giants of prog keys, namely Wakeman, Emerson, and Banks, but in these tracks I hear more of Kerry Minnear and Dave Stewart. And believe me, that's a good thing! Few things can turn me off a new release faster than hearing another Wakeman clone cranking out the arpeggios and trills. Ampledeed's core is the trio of Aaron Goldich (keys, vocals), Luis Flores (guitars, vocals, bass, ukulele), and Max Taylor (keys, drums, vocals, bass), but most of the tracks feature guests on a variety of instruments. I suppose some listeners might be put off by the stylistic inconsistency, but I find it refreshing — progressive rock for the ADD generation. 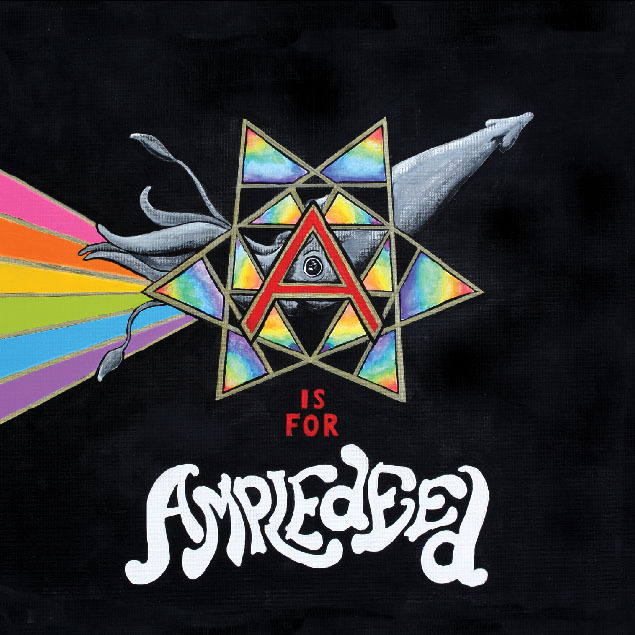 Ampledeed is a young band from California State University Northridge consisting of Max Taylor (percussion and keyboards), Aaron Goldich (keyboards), and Luis Flores (guitar). It is difficult to describe the kind of music they play, which is predominantly instrumental with vocals thrown in here and there in the oddest of places across the 14 songs on their debut release. Take for instance the opening track “We Breathe Time.” This song is nearly eight minutes long and you think that it is an instrumental slab of progressive jazz with numerous time signature shifts and tight arrangements. Then after 5:45 vocals drop in your lap unexpectedly. In many of the songs I found the vocals difficult to understand as they are down in the mix. But if you go to Ampledeed’s web site you can read the lyrics, though they tend to be alliterative and obscure. Roughly half of the 14 songs are instrumentals, where Ampledeed excels, playing very intelligent progressive jazz influenced rock intermingled with quiet acoustic and piano music. I detect vague references to Soft Machine and Frank Zappa. And for some reason, the song “Wake of the Galaxy,” a quiet song primarily with piano and vocals, reminded me very strongly of Anthony Phillips. This is a remarkable effort for a debut and self-released disc. Ampledeed reminds me of the type of bands released by Cunieform Records. They are a band to watch mature over the next couple of years.